The Updated Rush App: It’s Dope! RUSH: We also, folks, updated yesterday the Rush Limbaugh app for iOS and Android. It’s the usual bug fixes and performance updates. We made the app a little snappier. When you release an app… We beta test it before anybody sees it and we put it through its paces, but when you release it and it goes wide, then you learn a lot. And you people are sending us incredible comments about the app. It is valuable, it is heartwarming, it’s fascinating, and we are so appreciative. 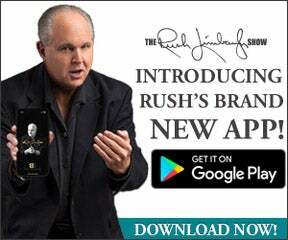 We’re getting so much feedback on the Rush Limbaugh app, and so much of it is positive, and so much of it is from people who are grateful that it exists and didn’t know we had it. And we’ve had it for a long time. I just never hyped it. I never promo’d it. We recently described it. It is… Folks, it’s dope. It is just awesome. And we’ve added some features like being able… It’s on the free side. You don’t have to spend any money to get a lot of usage out of the app. You can read transcripts of everything I say, for example, and share them. So you hear something brilliant, and you say, “Gee, I need to remember this so I can tell my friends or my dad or whoever.” You don’t have to remember it. You go to the app, you find the transcript, and you send it to them! You can share it, email, messages, social media. However you want. In fact, we would urge you to do that. Since we avoid the Twitter sewer for things like this, we would urge you to share. We actually set up our own miniature social media network in this regard. So, anyway, the app was updated yesterday with the usual bug fixes and performance updates that are not enumerated but it just means it runs a little faster and smoother and snappier. But we also included an increased — or increasingly understandable — little message. There was some confusion when we launched the app over whether it would work on Wi-Fi and/or cellular. Now, it was perfectly clear to me as the app designer, we issued the app so that it would default to not downloading data on cellular so that we wouldn’t be responsible for you chewing through your data plan. If you’re not on Wi-Fi and you’re using cellular to download anything, particularly audio or video, but anything, it eats through your data. And we didn’t want to be blamed for secretly causing you, so we set it so that you have to turn that on in the settings if you want to be able to use the app on cellular, on your data plan. We’ve made that a little bit easier to understand now by adding to it instructions-wise. But it’s really not complicated. Just go to the settings portion of the app, and you’ll see in the settings where you have the option to download or not download data, essentially use the app only on Wi-Fi if you want so that you don’t use any of your data, or you can turn it on to use cellular. And you can toggle that on and off as you wish. You’re not committed either way. So if you want to toggle on the cellular connection to download, okay. And just because your phone says you’re connected to cellular does not mean anything. You have to go to the app’s settings. This is what we were unclear about. So many people asked, “My phone’s on cellular, but it’s not working.” It’s because we didn’t have it turned on for you by default because we were thinking about you and your data plan and your pocketbook. It’s your option to use your data plan to download or access data at RushLimbaugh.com, and the app is now available. It should show up automatically in the App Store on your iPhone. I don’t know how Android works, if it’s automatic or not, but either way on either device, head to the app store, and you’ll see it there.